CIRAS is currently going through a process of up-skilling its staff. Earlier this year I completed the NEBOSH General Certificate, which was completely worthwhile and broadened my knowledge. To further my development, in June this year I started a secondment with Transport for London (TfL). I am working within Health Safety & Environment, supporting the Operations LU. The Operations LU HSE team support staff with ensuring their health and safety standards are met, and assist with risk assessments and any investigations amongst a very wide variety of other tasks. 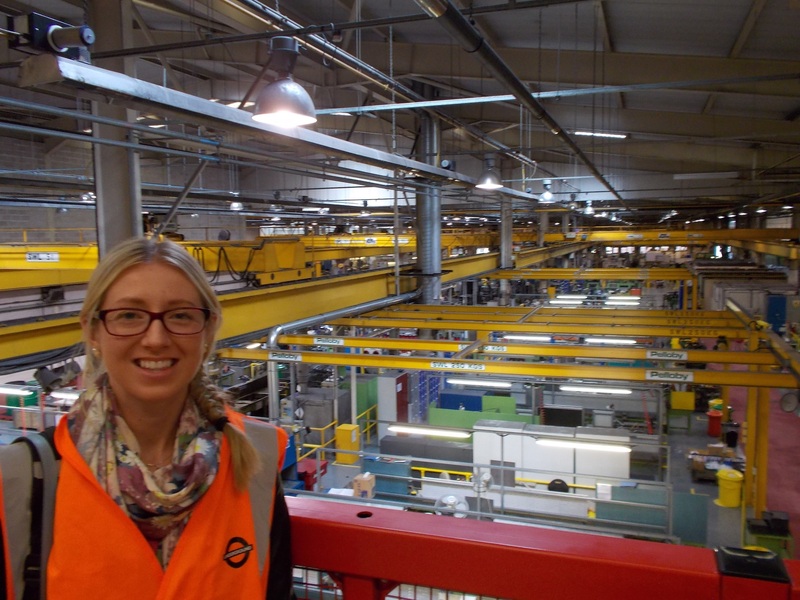 In my first couple of months, all the team have been really helpful in teaching me about their roles and giving me ‘behind the scenes’ tours of various depots and stations, where I have been shown some of the key activities undertaken, any challenges the staff face and what LU are doing to overcome these challenges. At Hainault depot I observed the impressive equipment LU have invested in to reduce manual handling activities. I’ve been over to Neasden depot, one of the largest on the network, where the new S Stock trains are maintained and repaired. At Leyton Signals and Engineering Centre I was shown some of the training signals and engineering staff go through which was really interesting, and will be heading over to Acton Training School in the coming weeks to learn more. One fascinating experience was going into an escalator room deep below the passenger escalators at a central London station, which was a complete revelation. Knowing ‘what lies beneath’ was a real eye-opener; I experienced the conditions escalator repairs staff work in and what control measures are in place. Baker Street station has had an issue with the platform-train interface on particular platforms, which has been highlighted in previous CIRAS reports, and I have been learning about the various proposals underway to tackle this issue. You may have seen the blue lights that have been installed on Platform One to highlight the gap to customers. This is a really exciting time to be a part of London Underground, as it goes through a period of change with the Fit for Future Stations work and the introduction of the Night Tube, amongst the many other initiatives to ensure LU is equipped to cater for the growing population in our capital and changing needs of their customers. Some of the projects that I am getting involved in include looking at manual handling activities for maintenance staff to identify any issues and recommend improvement actions, and assisting with the Customer Safety Strategy which has been implemented to reduce customer incidents on the LU Network by monitoring customer behaviours on escalators. I’ve also been part of the team to check compliance with the Construction Design Management (CDM) Regulations which were updated in April this year. To view the updated CDM Regulations go to the HSE website on http://www.hse.gov.uk/construction/cdm/2015/index.htm. Many of you will know we always encourage staff to report health and safety issues internally first, if they feel comfortable to do so, before contacting CIRAS. London Underground has a very robust health and safety machinery that ensures issues raised by any level of staff are discussed and shared, and if necessary are taken forward to the appropriate meetings. It’s refreshing to observe that CIRAS is also appreciated at London Underground as another means of reporting. The last few months have given me a much greater understanding and appreciation of the invaluable service that the HSE team at London Underground provides. It is inspiring to meet people with such enthusiasm and dedication to the service they provide, and I am very much looking forward to the coming months. This secondment is a great opportunity to build on the relationship between CIRAS and LU, and to learn about how one of our member companies deals with day-to-day health and safety issues whilst promoting the hard work that everyone at CIRAS puts in to helping the industry become even safer.